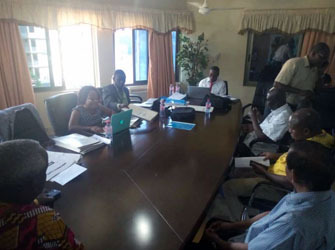 A 4-member team from National Accreditation Board (NAB), led by Dr. James Ben Hayfron-Acquah, paid an official visit to Kessben (University) College from Tuesday, 6th to Thursday, 8th November, 2018 to conduct quality auditing. The NAB team comprised the leader and Chairman, Dr. James Ben Hayfron-Acquah (from KNUST), Dr. Juliana Enos (from Univ. of Ghana), Mr. Emmanuel Owarre Nyarko (from NAB) and Mr. Joshua Afrim (from NAB). Kessben College was represented by the President, Prof. S. A. Osei; Registrar, Mr. Samuel Osei-Poku; the Dean, School of Liberal Arts, Prof. Opoku Agyemang, the Dean, School of Physical Sciences and Ag. Dean, School of Business, Prof. Keshaw Singh, the Finance Officer, Mr. Kwaku Sampeney, the Librarian, Mr. E. Kofi Bani, and the College Examinations Officer, Mr. Kofi Owusu Yeboah. During the debriefing session, the NAB team commended the College for its adherence to admission processes, requirements, and documentations. They, however, advised the College to engage senior lecturers at the School of Business to augment the existing staff strength. The team further advised that the College must verify all WASSCE/SSSCE results, and foreign certificates from appropriate examination bodies. The team expressed their appreciation to KC for its warm reception and interaction. On behalf of Kessben (University) College, the President thanked the NAB team members for their commendations, constructive criticisms, corrections and suggestions. He assured the team that the College would start to implement the recommendations made by the NAB team while waiting for the final report from NAB.